A spacious and meticulously maintaned upper maisonette with ample kitchen / dining and reception rooms. The maisonette is arranged over the upper two floors of this fine looking Edwardian house and offers three bedrooms and two bathrooms and all the internal joinery and fittings are of good quality. The property is quietly situated on the west side of First Avenue well off Uxbridge Road - a few minutes walk from both Wendell and Acton Park and the good local schools. Local shops on Askew Road are also convenient, and the shopping and transports hubs of Hammersmith and Westfield are within easy reach. The 607 bus route east along Uxbridge Road provides the fastest access to the Shepherd's Bush Central Line tube and Acton Central overground station and East Acton tube ( Central Line ) are within walking distance. 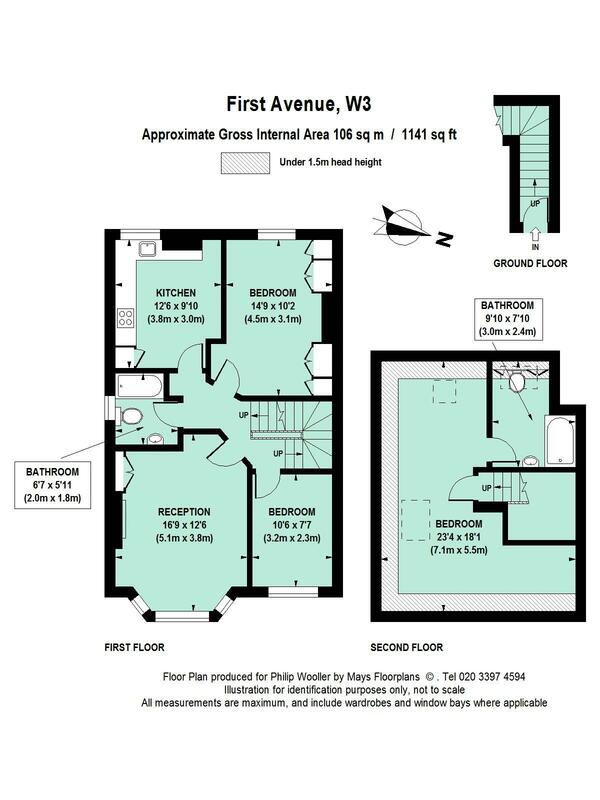 1141 sq ft / 106 sq m approx.